Oh hon, this was absolute perfection! 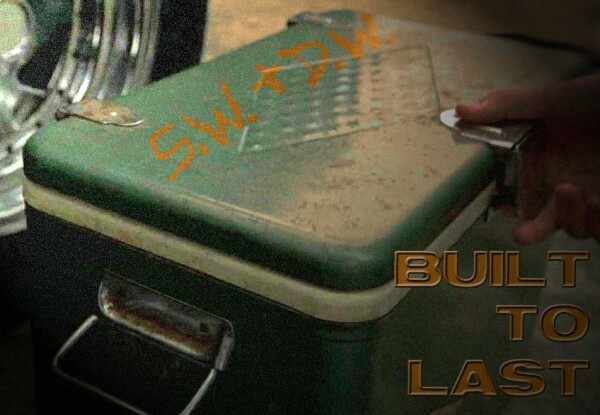 The Epicness of the Cooler! And of course Sam can't bear to part with it, how could Dean even think about throwing it away? It's almost like getting rid of the Impala! I'm so glad he understood where Sam was coming from, though. Aww thanks, glad you loved it. And definitely in my head canon at least, Dean and Sam would still be cute if they got to be together for that many more years. I'm so glad you liked it, yay! I tried really hard to get as many of your likes in there along with the soulmates prompt, so happy it worked for you. Happy Holidays! Oooohhhh, does Santa know what a terrific elf you are? Such an awesome present! Very nice and heart warming! Oh thank you so much, I'm glad you enjoyed it! I'll never get tired of reading domestic fics about Sam and Dean's life after leaving the hunting life. This is how they are supposed to be, messed up yet together for all eternity. Sweet and heartwarming. Thank you! This was so sweet. Thanks for sharing it with us.